Home / Uncategorized / SMF LA Show Announcements! We are excited to announce a few of the shows that will be a part of our 12th Annual Sephardic Music Festival. Keep up with us on the Sephardic site events page and see some details below. Music: “City of Refuge” acoustic set by Automatic Toys. • Join 30 Years After, JIMENA & the Israeli Consulate to light tonight’s candle at this multi-media event, as we come together to remember & celebrate Mizrahi history and culture through art and music, with a one-time-only “City of Refuge” acoustic set by Automatic Toys. • East meets West as we celebrate Jewish diversity with live music, DJs and Celebrity food blogger and chef, Nina Safar of Kosher in the Kitch fame. Diwon will fuse Yemenite music with electro hip-hop and cinematic psychedelia, drawing inspiration from the Middle Eastern musical canon, while a live band (TBA) blends musical styles from varied traditions. In addition to all the music, Nina Safar will be giving latkes a Sephardic remix, as she fuses together traditional potato latkes with Sephardic flavors such as zaatar and cumin to create dishes like shakshuka latkes, sabich latkes, falafel latkes and more. focus exclusively on the less familiar but captivating culture of the Jewish communities of Spain/Portugal, North Africa, the Middle East, and Central Asia. 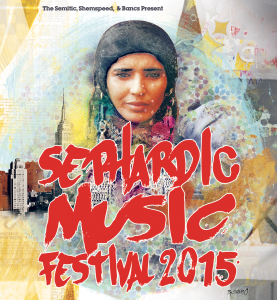 Sephardic Music Festival’s goal is unifying people through culture and education, celebrating diversity and common ground. The past years we have been profiled in The NY Times and The Wall Street Journal.